Die europäische Apotheke - wird es in Zukunft Apothekenketten geben? Dr. Fabienne Diekmann has been a member of the firm since 2006. Her clients primarily include companies from the pharmaceutical and food industries. She advises and supports these clients from obtaining manufacturing authorisation, through product development to distribution. She also assists pharmacists with matters concerning professional law and own brands and represents them in disputes with pharmacists' associations, supervisory authorities and health insurance funds. Thanks to her many years of experience in the health sector, she has strong contacts with EU and German federal and regional authorities. Dr. Diekmann gives presentations and writes about many different topics affecting the pharmaceutical industry. She is a member of the contract handbook working group of the B.A.H. (German association of pharmaceutical manufacturers), the board of editors of the magazine “Patienten- und PflegeRecht” (pmiVerlag) as well as the Pharma Licence Club Deutschland. with Prof. Dr. Armin Hatje at the University of Hamburg. 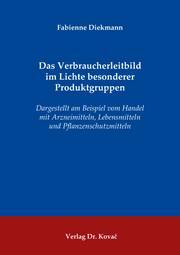 The dissertation was published in 2012 by Verlag Dr. Kovač under ISBN 978-3-8300-6171-7 and can be purchased from AMAZON, for example. consumer model, medicine, food, health claims, Reinheitsgebot [purity requirement], consumer, package insert, pharmacy selling price, information first, mandatory information, marking, labelling, law. Lecturer at the Apollon University of the Health Care Industry (Apollon Hochschule der Gesundheitswirtschaft): Oct 2006 - May 2011.